In Vietnam, the SD=HS program works on Pillar 1 in North Vietnam (previously in the three-year IFAD-Oxfam Novib Program “Putting lessons into practice: Scaling up people’s biodiversity management for food security” 2012-2015) and in South Vietnam (still on-going). The program does Pillar 3 work in North Vietnam. SD=HS’ primary target beneficiaries in North Vietnam are the indigenous people and smallholder farmers of Hoa Binh, Son La, Yen Bai and Thanh Hoa provinces, which are amongst the poorest regions of Vietnam (Pillar 1) and of Lao Cai, Ha Giang and Son La provinces (Pillar 3). In South Vietnam, SD=HS’ primary target beneficiaries are the farming communities of three provinces in Mekong Delta: An Giang province, Hau Giang province and Soc Trang province. Oxfam Novib works together with SEARICE and its local partners. In North Vietnam, for Pillar 1, these are the Field Crop Research Institute (FCRI), the Centre for Sustainable Rural Development (SRD), the Plant Protection Sub-Department (PPSD) of the Ministry of Agriculture and Rural Development. The Pillar 3 work in North Vietnam is executed by the Plant Genetic Resources Center (PRC) of the Vietnam Academy of Agricultural Sciences (national coordinator) with its provincial affiliates the Northwest Agriculture and Forestry Research Center (NAFRC), Mai Son Agriculture and Rural Development Department in Son La province, PRC and Vi Xuyen Agriculture and Rural Development in Ha Giang province, Temperate Crop Research Development Center (TDRC), and Sapa Agriculture and Rural Development Department in Lao Cai province. In South Vietnam SD=HS works together with the Mekong Delta Development Research Institute of Can Tho University (national coordinator) with Provincial Extension Centers (PPSD), Provincial Seed Centers and Provincial Department of Agriculture and Rural Development, and the Plant Resources Centre. The work in the Mekong Delta in South Vietnam builds on experiences in North Vietnam and Oxfam Novib’s past work in the south. Together with the intervention in the Northern province, the SD=HS program makes a good case for how this kind of comprehensive program can be relevant to a wide range of agricultural systems, from marginal and subsistence agriculture in the northern provinces of Vietnam to the prime irrigated and market-oriented agriculture in Mekong Delta. In the Mekong Delta, around 400 seed clubs were established through the Farmer Field School-Participatory Plant Breeding activities of past work of partners in Vietnam. These seed clubs are acknowledged by the local government as important seed-suppliers; providing 30 percent of the total seed requirement in the Mekong Delta in 2014 as compared to 17 percent supplied by seed companies in the same year. 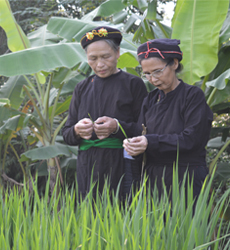 Through Farmer Field School activities in North Vietnam, women have become more seed secure as a result of strengthened technical capacities. They are now much better placed to control the quality of the seeds they produce, as well as to select and store seeds for the next growing season. Previously, each season they had to rely on purchasing costly hybrid rice seeds, the quality of which was reportedly unreliable. The women confirmed that their selected variety had a higher yield, improved quality, and fetched a higher price in the market. The Pillar 3 consolidated baseline report for Vietnam concluded that minor crops and wild food plants (some of which can be classified as ‘Nutritious and Underutilized Species’) play an important role in food security, especially in periods of hunger. 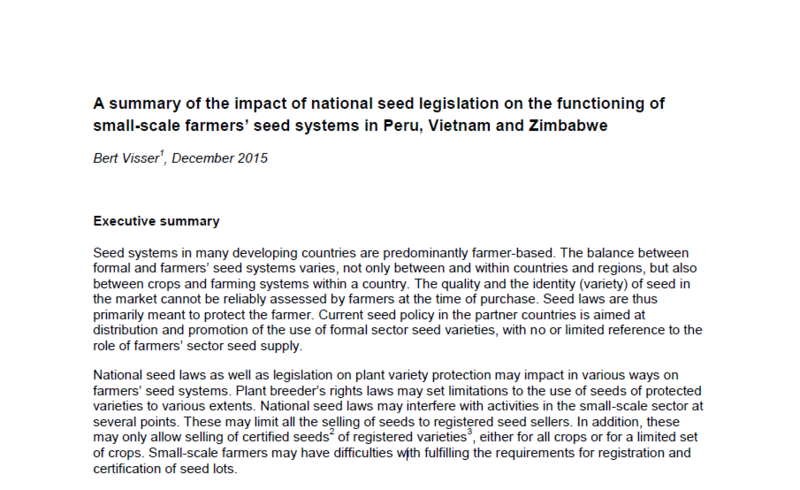 These findings are used in the further improvement of tools to be used by the farmers.